In 2-quart saucepan, combine pudding mix and milk; mix well. Bring to a full boil over medium heat, stirring constantly. Remove from heat; place sheet of plastic wrap on top of pudding, pressing out any air. Cool 30 minutes. Refrigerate 1 hour or until slightly firm. Slice banana; arrange slices in bottom of each crust. 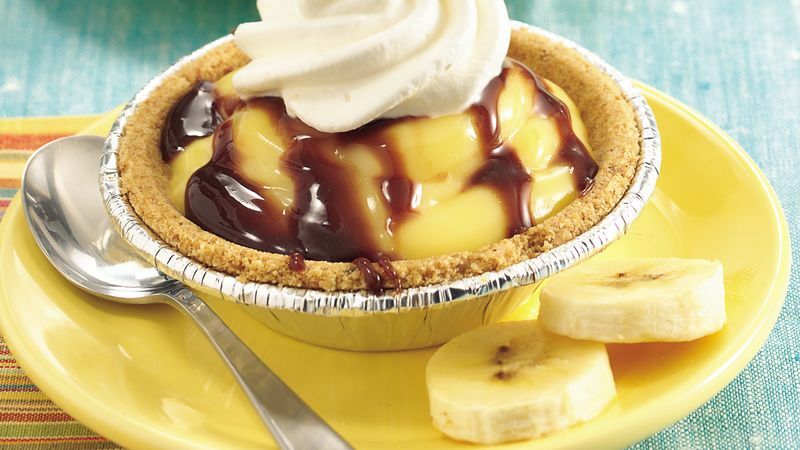 Spoon 1/4 cup pudding evenly over banana in each crust. Refrigerate at least 2 hours or until serving time. Just before serving, drizzle each tart with fudge topping. Garnish tarts with whipped cream; sprinkle with cinnamon. Garnish with additional banana slices, if desired. For even easier prep, substitute refrigerated pudding cups for the cooked pudding. Purchase chocolate fudge topping for these tarts. The hot fudge type is too thick to drizzle without heating first.